This Polizei model 1929 Luger was manufactured by DWM / BKIW some time around 1929 to 1930. This Luger is a toggle locked, recoil operated, semi-automatic pistol that is chambered in 9mm Parabellum. It utilizes an adjustable front blade sight and a fixed V notch rear sight that is located on the rear toggle link. It is fed by a single column 8 round detachable box magazine but it can also be fed by using a 32 round detachable drum. The abbreviation DWM translates to Deutsche Waffen und Munitionsfabriken and BKIW translates to Berlin-Karlsruher Industrie-Werke-Aktiengesellschaft. This model Luger has a serial number ending with a "T" suffix. This is important as research has shown that this model Luger along with those ending in the letters "S" and "U" were mostly sent to the Prussian Landjagerei. A Prussian document dated June 25, 1929 indicates that the 9000 officers and men of the Landjagerei were in the process of rearming with the Luger pistol as of May 29, 1929. Although some were also manufactured and sent to the Kriegsmarine(Navy), the Heer(Army), and the commercial market. 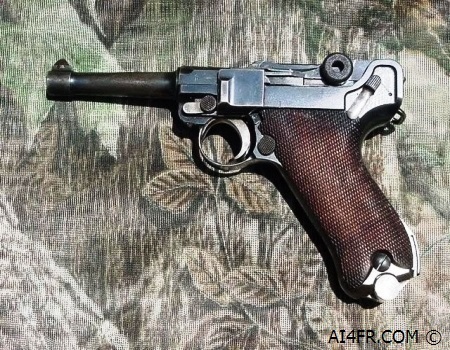 Now for some interesting mystique surrounding this Luger model and some possible reasons why there are no manufacturer markings on the top of the chamber or on the front toggle link. These “S”, “T” and “U” suffixed DWM Lugers are some times referred to as "Sneak Lugers" or "1933 Mauser Sneaks" in collector circles. The term Sneak is actually a word that was coined as a marketing gimmick by an enterprising dealer/collector some 25 to 30 years ago. Still, some believe that these Lugers were purported at one time to be manufactured on the sly to fool the Allied Commission after WWI. One rumor has it that since the numbering of the parts were in line with the commercial style of numbering, it would indicate that they were intended for commercial sale rather than the fact that they were for military and police issue. Another rumor has it that because of the treaty of Versailles which limited Germany in the production and amount of arms it could produce and possess, that the DWM company concealed some of their deliveries to the Landjagerei or German Police. They in essence were manufacturing and sneaking arms out and behind the backs of the Allied commission. While exciting as this may sound, one must remember that the monthly control visits of the Allied Control Committee had been halted since January of 1927, a few years before these pistols were assembled. Some also believe that since there are no markings on the top of the chamber or toggle, that these pistols were meant to fool the Allied control committee into believing that the pistols were assembled out of parts already on hand and not newly manufactured parts. 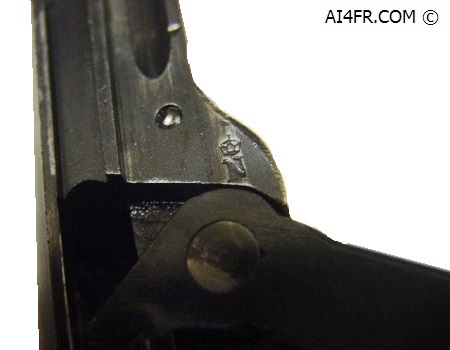 Another such "sneak" has to deal with the unit markings that are found on the front grip strap of these pistols and seen in the pictures below. It is or was believed that the first letter "L" in the unit marking indicated a paramilitary Nazi pistol. 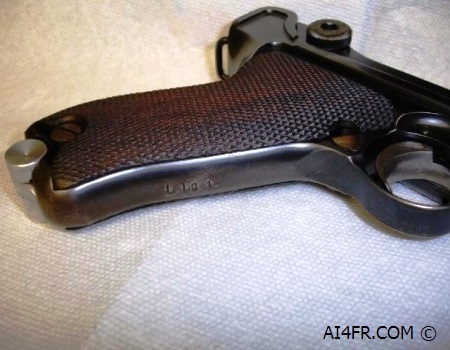 This rumor has it that the Lugers were actually reworked from old surplus Imperial Lugers. 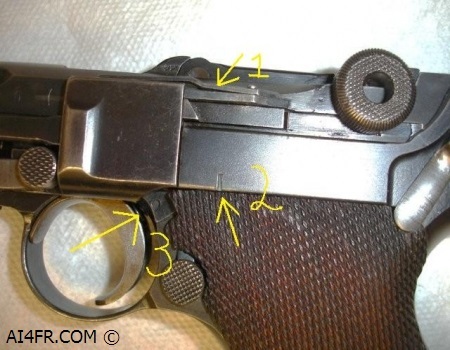 Since many of these DWM / BKIW Polizei Lugers from this period are found with no manufacturers markings on top of the chamber or on top of the front toggle link(see pictures below) some collectors have come to the conclusion that DWM was attempting to hide who the manufacturer was. Again, we must keep in mind that the monthly control visits of the Allied Committee had been halted since January of 1927, a few years before these pistols were assembled. The letter "L" in the unit marking actually indicates that the pistols were sent to the Prussian State Police or Landjagerei when they rearmed in 1929 and 1930. Another thought is that these pistols were originally produced by DWM for the 'Riff' contract and meant to be sent to the Berber tribes to even the odds in the uprising. When the pistols were ready to be shipped, the German government decided that it would be to much of a risk to send the firearms and the order was canceled. In case you may not be familiar about the "Riff" contract, it occurred between 1912 and 1926 when Spain tried to extend their territory over Northern Morocco and unify the two sections that they already controlled. Well, the native Berber tribes which are also known as the Riff tribes did not take to kindly to this move by Spain. The Riff tribes decided to fight back but, they were both outnumbered and out-gunned. Hence the need for some modern weapons. Before these weapons, the Lugers could be delivered, France teamed up with Spain and spoiled the uprising. Some believe that this shipment of Lugers that was originally intended for sale to the Riff tribes was sold to the Reichswehr in the early 1930s. Lastly, it is believed that these Lugers could have been made from parts still in stock at DWM in Berlin when Mauser took over production. These Lugers were manufactured and delivered by BKIW in 1929. This is just before they shut down the production of Lugers and shipped their manufacturing equipment to the Mauser firm in Oberndorf. These Lugers were then finished and delivered by Mauser. All of this causes us collectors no end of confusion some 80 years later. Did the Germans try to sneak arms past the inspectors, I am willing to bet that they did as it would only make sense. So there is probably some truth to the rumors discussed above. My guess is that these Lugers were manufactured in the open with both new and previously made parts. In my research, I have found no cases were the Germans attempted to hide the fact that they were rearming the local Landjagerei units with Lugers. The collecting and study of the Luger and the history behind these pistols has reached the stage of a minor religion. There has been a number of books and articles printed about these pistols to fill a library. I have briefly touched on the history of this one model of the Luger pistol. There is still a great amount of knowledge yet to be gained. 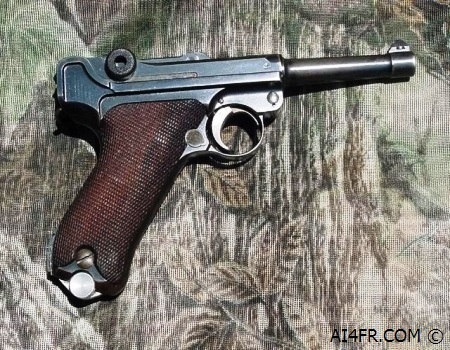 Thanks to the efforts of good folks such as Jan Still, Don Maus, Charles Kenyon and other great authors and historians, as well as the collectors from around the world and the many internet firearms forums keeping us all in touch, all of us collectors are getting closer to completing the story and history of this Luger model. In the text above we discussed some of the rumors and mysteries surrounding this model of Luger. In the picture on the left, the first arrow on the left in the picture points to the top of the chamber and the second arrow points to the top of the front toggle link. 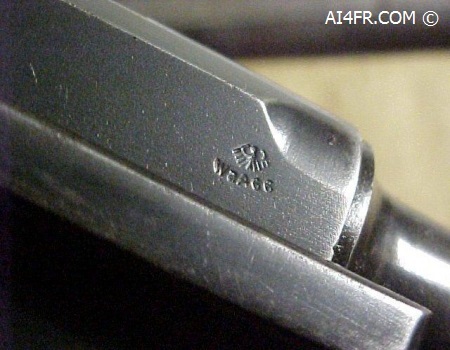 Notice here that in both places there are no manufacturers marks as seen on other Lugers such as the 1939 Mauser 42 code. In the photograph on the right, we can see the added Schiwy(Sear) and magazine safety. These parts were installed at a Prussian police arsenal and not at either the Mauser or the DWM factory. This addition or rather failed improvement was added to the Luger some time after August 30, 1933 by order of the Prussian police. The sear and magazine safety was a police and not a military requirement. The magazine safety was not successful and most were rendered inoperative some time after 1937. The point of arrow number one is resting on the sear safety(Schiwy). Arrow number two is pointing to a 1mm by 6mm slot that has been cut into the left side of the frame. This slot is used to help anchor the magazine safety in place. Arrow number three is pointing to the magazine safety. The magazine safety comes from behind the left grip panel and works it way around and under the trigger. On a large number of these Lugers, this magazine safety has either been removed entirely or a pat of it has been removed so that it will no longer function. 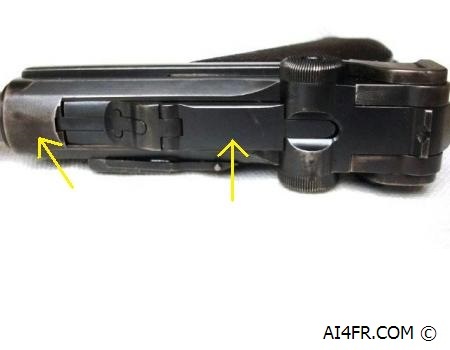 The tip of the third arrow is pointing to where the magazine safety has been cut on this Luger. The part that extends under the trigger is no longer in place. Another order dated March 17 1932 applies to the main toggle pin. it states that this toggle pin is to be stamped with the last two digits of the serial number. The toggle pin on this Luger is not stamped in such a way. So it was either missed while at the arsenal or is a replacement and not original to the pistol. 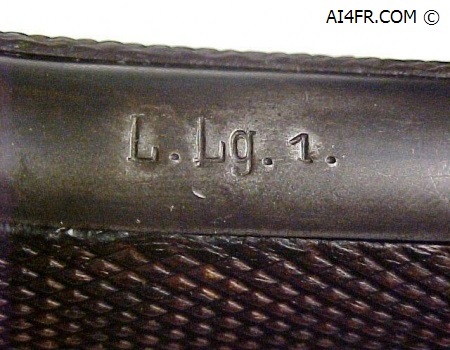 The unit marks found on this model of Luger are located on the front grip strap. The photograph on the left shows the front grip strap and unit marking while the picture on the right is a close up of this marking. The unit stamping of L. Lg. 1. indicates Landjagerei Luneberg weapon number 1 or Prussian State Police in the city of Luneberg Germany and is weapon number 1 of that police department. The Landjagerei also known as the rural militarized police were used successfully as stop-gap reinforcements. They were instrumental in policing and filling the gaps between the Weimar Reichswehr units on the Czechoslovakian and Polish frontiers. During this time the German Army was heavily out numbered and under equipped due to the provisions of the Treaty of Versailles. it has been estimated that there was about one soldier for every 10 miles of frontier. Article 168 of the Versailles treaty actually limited production of arms, munitions, or any war material to only factories that were registered by the Allied authorities. The Landjagerei units were helpful in stopping any insurgence by these border countries that were attempting to over run, and annex parts of eastern Germany just prior to WWII. Many of the cities in Germany lay in ruins after WWII, but Luneberg was spared and none of its historical buildings were damaged. The Axis in Defeat, Department of State publication 2423 from the U.S. Government Printing Office, in 1945, on page 22 shows that the Instrument of the WWII German surrender was signed at Luneburg, Germany, on May 4, 1945 at 1830 hrs. In the picture on the left, the crown over N mark was stamped on German firearms manufactured before April 1, 1940. The Crown over N stamp indicates that the gun has been proof fired with "nitro" or smokeless powder. This marking is found in several places on this pistol. The Eagle over WaA66 Waffenamt proof in the picture on the right indicates the inspector at Deutsche Waffen und Munitionsfabriken A.G., Berlin. The purpose of the Waffenamt stamp was to prove that each firearm and its components met the quality standards set forth by the Heereswaffenamt or Army Weapons Office. In order to carry this out, inspectors were assigned to individual firms for large corporations or to a specific area if there were several smaller manufacturers. These inspectors and their Waffenamt or WaA were responsible to the Heereswaffenamt rather than the manufacturer to which they were assigned. Each weapons office can be correctly identified by the individual acceptance stamp they used.